The feast of the Sacred Heart of Jesus is one of the most popular Catholic devotions. Many are familiar with the story of Jesus appearing to St. Margaret Mary Alacoque to request a special devotion to his Sacred Heart, and how it was later instituted as a feast day for the universal Church. But there is so much more to the Sacred Heart devotion than is commonly known. The devotion to the Sacred Heart of Jesus has its roots all the way back to the time of the Apostles. In fact, St. John the Evangelist is the Apostle associated with the Sacred Heart devotion because, one, he was known as the disciple whom Jesus loved; two, he was called the “Apostle of Love” due to the theme of love repeated in his Gospel and epistles; and three, because he had the special privilege of reclining on the chest of Jesus at the Last Supper. In the Middle Ages the heart of Jesus became a specific object of adoration as the center and wellspring of Jesus’ passionate and infinite love for us. The Sacred Heart also represented Jesus’ woundedness, both the physical wound incurred to his physical heart on the cross (by the centurion’s spear), and the spiritual wound of a love so great that he gave up his life, even while this love is scorned by those for whom it was so generously given. A devotion to the Sacred Heart was thus twofold; one, it adored the infinite and self-giving love of Jesus, and two, this adoration was given to Jesus’ heart in reparation for the disdain, rejection, and coldness his loving heart endured from others. Four centuries later in 1673, Jesus appeared to St. Margaret Mary Alacoque, showing her a vision of the now famous image of his Sacred Heart surrounded by flames of love. He said to her, “My Heart is so full of love for men that It can no longer contain the flames of Its burning love. I must divulge to men the treasures of My Heart and save them from perdition.” Although the Sacred Heart devotion was devoutly practiced by many saints and religious in the previous centuries, it was not yet widespread throughout the universal Church. This was the special mission given to St. Margaret Mary; to her Jesus revealed his desire for a stronger, increased, and widespread devotion to his Sacred Heart. The Divine Mercy, the feast of Corpus Christi and the Eucharist, the Sacred Heart of Jesus, and the Immaculate Heart of Mary are all marvelously interconnected. Providentially, they are also back to back feasts on the Roman Catholic liturgical calendar. However, this article will attempt to skim the surface of these mysteries just a bit, so that you can appreciate this special devotion in a deeper theological way. The very rich and interesting history of the Sacred Heart devotion is closely connected with the Divine Mercy devotion, Eucharistic Adoration, and the Immaculate Heart of Mary. On the cross after Jesus died, the centurion thrust his spear through Jesus’ side and into his heart. We know this because blood and water flowed out of this wound. 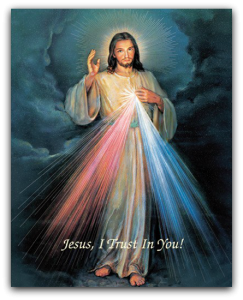 In the Divine Mercy image revealed to St. Faustina, the red and white rays signify the blood and water, which flowed from the side of Jesus at the point of the centurion’s spear, that is, out of his heart. The Divine Mercy devotion focuses on the infinite and generous mercy of Jesus as he willingly gave himself up to reconcile us to God the Father. The Sacred Heart of Jesus devotion is also closely connected with devotion to the Blessed Sacrament. In the revelations of the Sacred Heart to St. Gertrude and St. Margaret Mary, Jesus shows that the Sacred Heart is more than a symbol used to represent his love; his Sacred Heart is also his real heart of flesh. The object of the Sacred Heart of Jesus devotion thus became connected with a devotion to the Real Presence of Jesus in the Blessed Sacrament; that is, his soul and divinity, and his body and blood. The real, physical Sacred Heart of Jesus is made present to us in the Eucharist! Many Eucharistic miracles attest to this fact. In one instance, the Eucharistic Miracle of Lanciano, the flesh is cardiac tissue with an AB blood type! When we are adoring the Real Presence of Jesus during Eucharistic Adoration, and receiving Holy Communion at Mass, we are adoring and consuming the real flesh and blood, soul and divinity of Jesus’ Sacred Heart, given up in love for our salvation, which is simply profound! 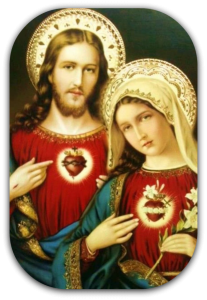 The Sacred Heart is also tied to the Immaculate Heart of Mary. It is no coincidence that the feast day of the Immaculate Heart of Mary is the day following the Sacred Heart feast day. Because Mary is Jesus’ mother, Jesus received his human nature from her. That is, Jesus received his flesh and blood, including the organ of his heart, from Mary. Even more profoundly is the connection of Mary’s heart with the heart of Jesus during the Passion. When Mary presented Jesus in the temple after his birth, Simeon revealed to her that because of Jesus’ sufferings, “a sword will pierce through your own soul also” (Luke 2:35). Her suffering would be intimately connected to the suffering of Jesus on the cross. 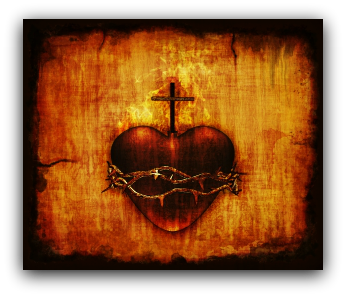 St. Clare, St. Catherine of Sienna, St. Aloysius Gonzaga and Pope John Paul II, to name a few, are saints who had a particular devotion to the Sacred Heart of Jesus. These saints wanted to have a heart like His. Devotion to the Sacred Heart of Jesus includes prayer, frequent Holy Communion, visits to the Blessed Sacrament in the Tabernacle or monstrance, and devotion to the Immaculate Heart of Blessed Virgin Mary. 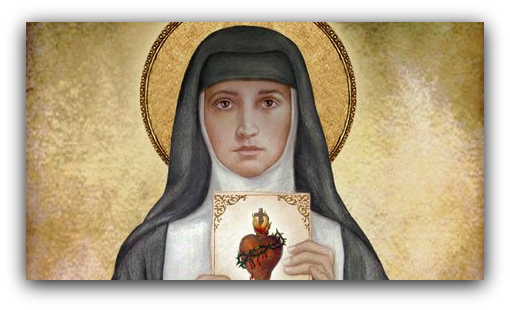 In addition there are the particular devotions revealed specifically to St. Margaret Mary for widespread devotion in the universal Church: The Sacred Heart Feast Day, The First Friday Devotion, and the veneration of an image of the Sacred Heart. With these devotions Jesus eagerly awaits to shower us with special graces. All of these special promises of Jesus for those with a special devotion to His Sacred Heart can be found in the book penned by St. Margaret Mary called The Letters of St. Margaret Mary Alacoque. I will bless every home in which an image of My Heart is exposed and honored. I will console them in all their difficulties. I will be their refuge during life and especially at the hour of death. Sinners shall find in My Heart a fountain and boundless ocean of mercy. I will give to priests the power of touching the hardest hearts. Those who propagate this devotion shall have their names written in My Heart never to be blotted out. When we enthrone the Sacred Heart of Jesus in our homes, parishes, workplaces, schools, communities and nations, the reign of Jesus Christ comes to that place is a special way. We consecrate ourselves to Jesus – making a covenant of love with Him. Our purpose is to bring forth Jesus Christ as the Enthroned King of Kings and Lord of Lords, placing everything under the influence of His Sacred Heart. This three day preparation or the Enthronement can be done anytime, but is most appropriate during the Triduum of the Sacred Heart, with the first day being on the Wednesday before the feast, the second the Thursday and the third day, with the actual Enthronement, on the feast itself. Sacred Heart of Jesus, we salute You, for You are the King of Kings, the Ruler of families and nations. But sad to say, in many nations, You have been dethroned and rejected. This is mainly because You were dethroned in many families of which the nations are composed. Loving Master, we want to make up for this insult to Your Divine Majesty by lovingly enthroning You as King of our (family or organization). Like Mary and Joseph, like the shepherds and the three kings, we want to give You a royal welcome as they did when they adored You in Your humble home in Bethlehem. Like them, we have no royal throne to offer You, but we can and will offer something even more pleasing to You. In our (home or organization), Your throne will be a living throne: the loyal hearts of the members of this (home or organization); Your royal crown: our acts of love. O Mary, queen of our (home or organization), by your loving submission to the will of God in all things, obtain for us the grace never to sadden the Heart of our King by willful disobedience of His commandments or those of His Church. May it be said of us what the Gospel said of Jesus, “He was subject to them.” Good St. Joseph, guardian of our (family or organization), help us to make this Enthronement the beginning of a new life of love in this (home or organization). Through the presence of the Sacred Heart of Jesus in our (family circle or organization) and through your powerful intercession, may we receive the grace to know our King more personally, love Him more ardently, and thus serve Him more faithfully. Amen. O Christ Jesus, I acknowledge You to be King of the universe; all that has been made is created by You. Exercise over us all Your sovereign rights. We hereby renew the promises of our Baptism, renouncing Satan and all his works and empty promises, and we promise to lead henceforth a truly Christian life. 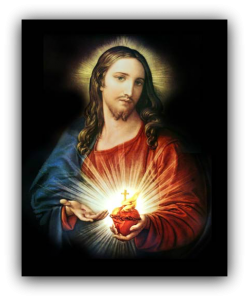 Divine Heart of Jesus, we offer You our poor actions to obtain acknowledgment by every heart of Your sacred kingly power. May the kingdom of Your peace be firmly established throughout the earth. Most Sacred Heart of Jesus, Your kingdom come through Mary! Sacred Heart of Jesus, protect us! Immaculate Heart of Mary, queen of heaven, pray for us! St. Michael, first champion of the Kingship of Christ, pray for us! You may end by Singing an appropriate hymn. Dear Jesus, Son of God, when we call You “Brother,” we speak the truth for You are indeed just that. John told us so when in his Gospel he wrote, “But to as many as received Him, He gave the power of becoming sons of God.” Therefore, we are Your adopted brothers and sisters and co-heirs of heaven. And since You are a King, we have the privilege of being members of a royal family, as were Mary and Joseph. How honored we will be to have our Brother King come to dwell in our (humble home or organization) in order to share our joys and sorrows! Once You are enthroned in our (family or organization), we will understand as never before the meaning of the words, “And the Word was made flesh and dwelt among us.” No longer need we envy Mary and Joseph at Nazareth, for Your abiding presence in our (home or organization) will make our (family or organization) another Nazareth wherein we will give proof of our love. We will do this especially by the practice of charity: trying to love each other as You love us and to build a more just world in solidarity with the poor. O Mary, queen of Nazareth and Mother of Jesus, obtain for us the grace to appreciate the presence of Your Divine Son enthroned in our (home or organization). Grant us a greater love for Jesus ever present in the Blessed Sacrament, a deeper love for the Holy Sacrifice of the Mass, a more ardent longing to unite ourselves as often as possible with our loving Savior in Holy Communion. Good St. Joseph, you were privileged to share the joys and sorrows of your foster son at Nazareth. Teach us how to share our everyday joys and sorrows here on earth with our Brother, Jesus, so that one day our entire (family or organization) may join you and Mary in sharing the joys of heaven. There we will see my King and Brother face to face and with you love adore, thank, and praise Him for all eternity. Amen. “My delight is to be with the children of humankind.” These words from the Book of Proverbs were certainly spoken about You, dear Jesus, Who came down to share our exile here below. You delight in being with us because we need You and You are our best Friend. You love all without exception: saints and sinners, the rich and the poor, the learned and the uneducated. You love all races, all peoples, but above all You love all families. You proved that love by spending thirty years in your home in Nazareth, and during Your public life, many times You accepted invitations to visit families. You even told Zacchaeus the sinner that “I must stay in your house today.” But there was one family for whom You had a special love, that of Lazarus, Martha, and Mary. How many times did You stay in that beloved family at Bethany! It was there You found rest and solace after the fatigue of Your labors and the insulting attacks of Your enemies. At Bethany, You were always received as a royal Guest, but also You were treated as a Brother and Friend. Dear Jesus, once You are enthroned in our (home or organization), we too want to be Your true friends. We want You to feel at home with us. We will try to console You for those who do not love You. We will serve You like Martha; listen to You like Mary; and thank You like Lazarus. We feel confident that You will richly bless our (family or organization) and all those who invite You into their lives. And, if there are in our (home or organization) prodigal sons or daughters, lost sheep, sinners dead to the life of grace, we know that You will say to them as you did to Zacchaeus, “Today salvation has come to this house.” You will be to them a loving Father, a Good Shepherd, a Divine Physician, for You are “the Resurrection and the Life.” O Mary, Mother of our best Friend, and St. Joseph our patron, obtain for us the grace to make our (home or organization) a true Bethany for the Sacred Heart. May our friendship with Jesus be loving, loyal, and lasting. May our daily living with my King and Guest bring about a closer union of hearts, of minds, and of wills so that our entire (family or organization) united with the Heart of Jesus here on earth may remain united with Him and the Father and the Holy Spirit in our true home, heaven, for all eternity! Amen. Plan to receive the Sacrament of Reconciliation and celebrate the Eucharist before or on the day of the Enthronement Ceremony and prepare a place of honor for the Sacred Heart image and a place for a Marian image as well. This place of honor will be your prayer place as you live out your covenant of love. Wall tables or shelves are ideal since there is generally room for a Bible, rosaries, candles, flowers and pictures of loved ones. All gather around the image of the Sacred Heart; father, mother and children nearest to the priest. Almighty and everlasting God, who does approve the painting and sculpturing of the images of Your saints, so that as often as we gaze upon them we are reminded to imitate their deeds and sanctity; vouchsafe, we implore You, to bless and sanctify this picture made in honor and in memory of the Most Sacred Heart of Your only begotten Son, our Lord Jesus Christ; and grant that whosoever, in its presence, will suppliantly worship and honor the Most Sacred Heart of Your only begotten Son, may obtain through His merits and intercession grace in this life and everlasting glory in the world to come. Through Christ our Lord. Amen. The priest sprinkles the picture with holy water. The priest or the father (or in his absence the mother) then installs the picture or statue in its place of honor. The priest then addresses a few words of exhortation to those present. All kneel. The priest recites the official Act of Consecration. O Sacred Heart of Jesus, who did make known to St. Margaret Mary Your ardent desire to reign over Christian families, behold us assembled here today to proclaim Your absolute dominion over our home. Henceforth we purpose to lead a life like Yours so that among us may flourish the virtues for which You did promise peace on earth, and for this end we will banish from our midst the spirit of the world which You abhor so much. You will reign over our understanding by the simplicity of our faith. You will reign over our hearts by an ardent love for You; and may the flame of this love be ever kept burning in our hearts by the frequent reception of the Holy Eucharist. Deign, O Divine Heart, to preside over our meetings, to bless our undertakings, both spiritual and temporal, to banish all worry and care, to sanctify our joys and soothe our sorrows. If any of us should ever have the misfortune to grieve Your Sacred Heart, remind him of Your goodness and mercy toward the repentant sinner. Lastly, when the hour of separation will sound and death will plunge our home into mourning, then shall we all and every one of us be resigned to Your eternal decrees, and seek consolation in the thought that we shall all one day be reunited in heaven, where we shall sing the praises and blessings of Your Sacred Heart for all eternity. May the Immaculate Heart of Mary and the glorious Patriarch St. Joseph offer You this our Consecration and remind us of the same all the days of our life. Glory to the Divine Heart of Jesus, our King and our Father! The priest here asks those present to say with him one Our Father and Hail Mary for all absent members, both living and dead. Glory be to You, O Sacred Heart of Jesus, for the infinite mercy You have bestowed upon the privileged members of this family. You have chosen it from thousands of others, as a recipient of Your Love and a sanctuary of reparation wherein Your most loving heart shall find consolation for all the ingratitude of men. How great, O Lord Jesus, is the confusion of this portion of Your faithful flock as we accept the unmerited honor of seeing You preside over our family! Silently we adore You, overjoyed to see You sharing under the same roof the toils, cares, and joys of Your innocent children! It is true we are not worthy that You should enter our humble abode, but You have already reassured us, when You revealed Your Sacred Heart to us, teaching us to find in the wound of Your Sacred Side the source of grace and life everlasting. In this loving and trusting spirit we give ourselves to You, You who are unchanging life. Remain with us, Most Sacred Heart, for we feel an irresistible desire to love You and make You loved. May our home be for You a haven as sweet as that of Bethany, where You can find rest in the midst of loving friends, who like Mary have chosen the better part in the loving intimacy of Your Heart! May this home be for You, O beloved Savior, a humble but hospitable refuge during the exile imposed on You by Your enemies. Come, then, Lord Jesus, come, for here as at Nazareth, we have a tender love for the Virgin Mary, Your sweet Mother, whom You have given us to be our Mother. Come to fill with Your sweet presence the vacancies which misfortune and death have wrought in our midst. Yes, dear Lord, take up Your abode with us, so that we may live in Your love and in Your presence, we who proclaim You as our King and wish no other! May Your triumphant Heart, O Jesus, be forever loved, blessed, and glorified in this home. Your Kingdom come! Amen. As an act of homage to the Immaculate Heart of Mary recite the Hail Holy Queen,standing. All: Glory to the Most Sacred Heart of Jesus, forever and ever. Amen. May the blessing of almighty God, Father, Son, + and Holy Spirit, descend upon you and remain forever. Amen. Then the members of the family and the priest sign the Certificate of the Enthronement, which should be framed and hung near the picture of the Sacred Heart or kept in the family archives. O Jesus, through the Immaculate Heart of Mary, I offer You my prayers, works, joys, and sorrows of this day, for all the intentions of Your Sacred Heart, in union with the Holy Sacrifice of the Mass throughout the world, in reparation for sin, for the intentions of all my friends and associates, and in particular for the intentions of the Holy Father. Dear Sacred Heart of Jesus, I renew my pledge of love and loyalty to You. Keep me always close to your loving Heart, and to the most Immaculate Heart of Your Mother. May I love others more each day, forgiving other’s faults as You forgive me of my sins. Teach me to see You in all of my brothers and sisters, loving them as You love them, especially the poor and oppressed, that I may be instrumental in bringing about justice and peace. Please help me carry my cross daily out of love for You and help me strengthen this love by frequent participation in the Celebration of the Eucharist. Thank You, dear Jesus, for all the blessings of this day. Protect me and others during this night. Help me to live that I might get to heaven. Our patron saints and guardian angels, pray for us! 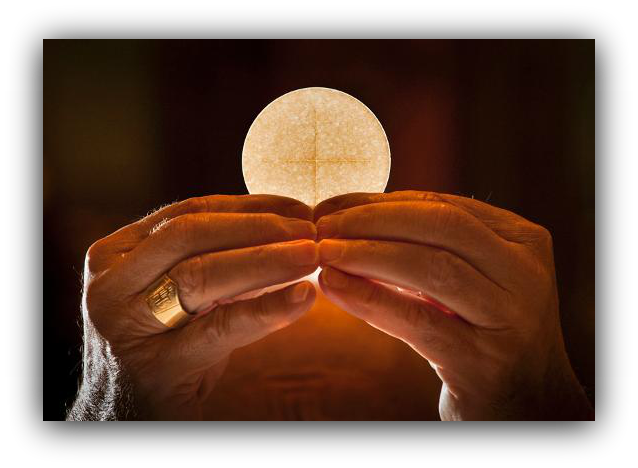 Celebration of the Eucharist, as often as possible and especially on Sundays and Holy Days of Obligation. Faithful use of the Sacrament of Reconciliation (recommended once a month). Holy Hours in the Home and Eucharistic Adoration in church. Monthly First Friday and First Saturday celebrations . Celebration of Solemnities or Feasts of the Holy Body and Blood of Christ, Sacred Heart, Immaculate Heart of Mary, and Christ the King . Make a difference for Christ in society.